(Above) 1936 Picture from an old family album is scanned and restored, ready to send to relatives via email, used in Powerpoint shows, or simply printed as a bright, new photograph. Picture has been improved in several ways, including scratch removal and dust spot fixes. (Below) This 1979 picture is derived from a deceased person's old slide collection. 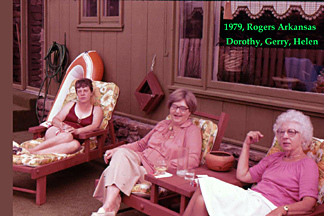 It looks like a mundane picture of three people, but in terms of family history, this was a key image for posterity, showing the one and only time that one sister spent time with another in over 40 years! As is occurring to most old slide collections, the film was undergoing color degradations that were difficult to completely correct. The slide was scanned and improved in many ways, including dust removal, cropping, contrast enhancements. The labelling was added and then the picture was printed and placed into a normal Family Album (as is the case with many families that shot mostly slide film, the slide had never been printed and thus had never made its way into the permanance of a real Family Album). FAMILY EVENT PICTURE IMPROVEMENT SERVICES ALSO OFFERED. Many times, a family arrives home from a trip to Europe, a wedding, or even just an big soccer game with a camera card stuffed with images, but all that picture-taking often remains unfulfilled because no one ever thoroughly culls the results and uses picture improvement skills to produce final images that will sparkle in emails, Powerpoint shows, or as gifts to send friends and relatives. Essays and pictures about the Pioneers of the Outdoor Gear Revolution, 1945-The Present, 45+ pages, five published books, and always expanding! My Book about Frostline Kits of Colorado was my first, published over four years ago. Please visit my FROSTLINE PAGE if interested. Near the top of that page, you'll see a "Banner." You will click on that to get to my Publisher. There you can register, then see a large book preview and order the book. I now have a total of five books published. My second book was released about three years ago, and details the history of GERRY Mountain Sports, founded in 1945. It is titled "To Live in the Mountains." The third book in the series takes on the history of one of the greatest of the classic gear companies, Holubar of Colorado. It has been enthusiastically embraced by those "in the know" about classic gear. It was honored at Chautauqua in Boulder, Colorado as one of the year's best "Local History" products. Then there is my book about that most controversial of the early gear companies, Stephenson's Warmlite Equipment Co. ....My most recent book details the early years of the controversial Seattle-based MSR (Mountain Safety Research)... All five books feature major contributions by their Founders and/or their Presidents.